In recent years, the increasing competitiveness of wind and solar power has been widely hailed. But there is a cloud to this silver lining – power production does not match power demand. As a result, the actual value of wind and solar power will decrease as we get more of it. Craig Morris says policymakers should pay attention. The more solar and wind power we have, the more important it becomes to match power demand. While everyone celebrates the increasing competitiveness of wind and solar, German analyst Lion Hirth says the value of these energy sources to our energy supply will decrease as we build more. On 1 December, 2014, Germany’s conventional power fleet was able to sell around 60 GW of electricity at nearly 7 cents per kilowatt-hour. But just before Christmas, wind power picked up, bringing conventional generation down to around 20 GW – and the price down to a single cent. Sales revenue thus dropped to 1/21th of its high level, from 420 (60 x 7) to 20 (20 x 1). Clearly, wind and solar cannot finance themselves on wholesale markets because prices will plummet as soon as a lot of wind or solar is available. Edited chart taken from Fraunhofer ISE. First, we have to make a distinction between price and value. The price is what wind and solar power cost. The value is what that green electricity offsets. Solar campaigners in the US talk about the value of solar instead of the price because solar power production peaks at midday – at a time of peak consumption. This solar power therefore initially offsets peaking generators, which are more expensive to run. But for how long? A few years ago, analysts at the Brattle Group found that enough PV to cover around seven percent of peak demand would actually save costs overall in Texas. But what happens when PV peaks at 15 or 20 percent of demand? Hirth has looked into this matter repeatedly. His numbers apply for Germany and cannot be transferred, say, to Texas, which has air-conditioning – and hence higher power consumption in the summer than in the winter (the opposite of Germany). But the principle applies everywhere, and it does not look pretty for high penetration levels of wind and solar power. Both wind and solar power start off with a value exceeding the price; the “value factor” is above 1.00. “Wind power production correlates seasonally with power demand, at least in Germany, whereas solar power production correlates with daily power peaks around noon,” Hirth explains the value factor above 1.00. But the value of wind power falls below that level when it makes up only a few percent of total supply. Solar starts off with a much higher value but quickly plummets. Once the value factor has fallen below 1.00, the price of this electricity is greater than the power it offsets. Hirth’s numbers represent the share of wind and solar in electricity supply, not the share of peak demand. Solar now covers around seven percent of total power demand in Germany but peaks at close to a third of demand quite regularly on sunny days. So the business case for wind and solar gets worse as penetration levels increase – even as the price of these energy sources becomes more competitive. The value of solar remains constant (in Minnesota) rather than dropping, according to Hirth’s calculation. As the article for the chart explains, the perspective is the consumer’s, not the utility’s. As a former Vattenfall (one of the main utilities in Germany) employee (but now independent), Hirth shows us that power markets will see a diminishing value for wind and solar. The “value of solar” argument therefore only works at very low levels of penetration from the utility perspective. At higher levels, it works against wind and solar. For the past few years, there has been a growing recognition that, to quote German energy analyst David Jacobs, “refinancing any type of power plant via spot market sales of electricity will be increasingly difficult.” But conventional plants can respond to low prices by reducing production. As I put it once, wind and solar undercut themselves; the more wind and solar power is produced, the lower prices will be on wholesale markets. Hirth estimates that there is practically no business case for more wind and solar in Germany at a combined penetration level of around 50 percent in Germany. Yet, the German government has an official target of 80 percent renewable electricity, and the large gap will not be filled by biomass, hydropower, and imports. Wind and solar will have to grow far beyond 50 percent. I interpret Hirth’s analysis to show how useful feed-in tariffs will be towards meeting a political target that the market cannot bring about on its own. Hirth disagrees. “Numerous political recommendations can be drawn from my analysis,” he argues. Wind and solar face an era of much slower growth in Europe. Spain and Italy reached high levels but have practically collapsed since, for instance. European governments are increasingly pushing for wind and solar to react to price signals. But because they undercut themselves, the only way these two energy sources can react to price signals is by not growing any further. Without policy changes, the market will not push the energy transition to 80 percent renewable power. Indeed, the transition might be over much earlier. After all, it was society that called for the Energiewende, not the market. Price and value – what REs could offset isn’t what they do in the official balance sheets. ” New entrants to an electricity market that EDF dominates find it hard to compete with prices that are artificially capped, but their legal challenges have so far failed. It looks hell for Fortum, but in public they hope for an increase in power demand in the Scandinavian countries of 0.5%/a …..
That the power prices are falling much faster and the RE’s gaining market shares much quicker they just realized, they were safed by hydro power this year. 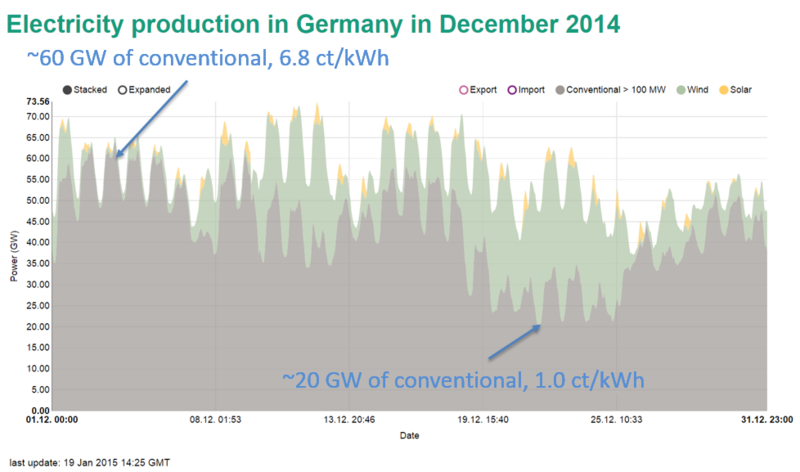 Concerning the first chart (” Electricity production in Germany in December 2014″) the small generators are missing. Click an “All” in the ISE Fraunhofer data collection page, there in the left column. The piece not shown here is the value factor for a nuclear, coal or gas plant. I suspect that their values also go down as they become a greater portion of the grid. We purposely overbuilt the coal, gas and nuclear, knowing that they would need to be curtailed at times of low demand. In a fossil free future we will also need to overbuild renewables, curtailing their output occasionally, lowering their ‘total’ and off-peak values. Unfortunately, the fuel costs for wind and solar are zero, so the marginal costs are nearly zero as well. This is not true for fossil fuels, and so they are being priced out of the market at times. There will be a need for some backup or storage. Hydro plays well here, and can expand in some places. The current buzz is batteries here, but it is not the cheapest. currently fossil fuel peakers fill in at a much higher price, sitting idle for most of the year. When storage costs come down further those technologies will replace the current generation of peakers as well. Thank you for the reference to the Hirth paper, this is just what Jesse Jenkins is referring to with capacity factor limits, and is certainly important for current policy design. On the other hand, it is looking at small changes away from the already highly optimized system. There are now several extensive simulations describing energy mixes for Germany in 2050, with very limited fossil fuel usage, 80% or more reduction in CO2 emissions, and typically 15-20% PV contribution to the entire energy economy (not just electricity). These have, in some cost optimized fashion, filled in the holes in the PV contribution. 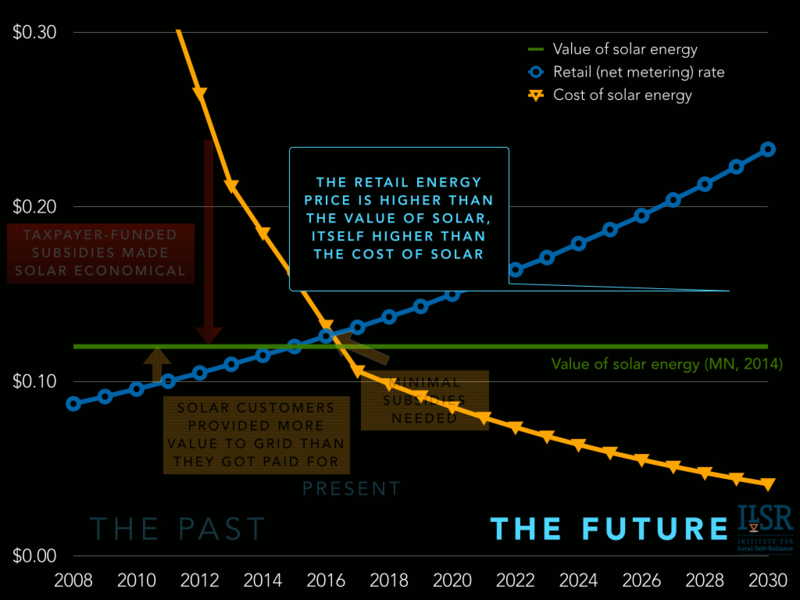 It would be useful to see what the value of solar looks like in these re-optimized scenarios. The Fraunhofer ISE German-2050 study, in particular, shows a very broad cost minimum for trading off between wind and solar. What is missing from the equation is the external costs of conventional power production. The reason most of us support renewables is because of the damage that conventional power production does to our health and climate. If you would take these damages into account the price of conventional power production will always be at least the fuel costs plus the external costs. This would create a totally different business case for renewables.